This year, Commonwealth Enterprise and Investment Council (CWEIC) is an official partner of Vibrant Gujarat. Prime Minister Narendra Modi’s attendance at last year’s Commonwealth Heads of Government Meeting in London demonstrated the leading role India can play in the Commonwealth of the future. This off-field success built on India’s other Commonwealth wins last year—66 medals, including 26 golds, at the 2018 Commonwealth Games on Australia’s Gold Coast. Back in London, Prime Ministers of the 53 Commonwealth member countries set an ambitious agenda to work together to promote prosperity, democracy and peace. My organisation, the Commonwealth Enterprise and Investment Council (CWEIC), is the place for business in the Commonwealth and a place for public-private Commonwealth engagement. Our members are Commonwealth businesses and governments, and we believe there is a central role for business to help Commonwealth governments meet the ambitions they set out in London. We also believe there is a central role India can play too. India boasts strong Commonwealth trade connections, but we still see huge scope for these to strengthen. The United Kingdom is an obvious partner, as UK companies already employ almost a million people across India. Commonwealth trade opportunities are not confined to post-Brexit UK, however–Singapore and Mauritius, for example, are two of India’s largest FDI funders, and India has been very vocal about its trade interests with African Commonwealth nations. The new India has the potential to shape the future of Commonwealth trade. 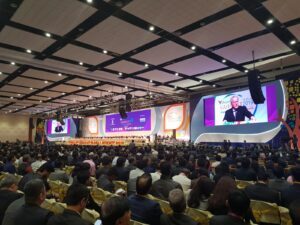 It’s for these reasons we are an official partner of this year’s Vibrant Gujarat, and why we are in Ahmedabad with one of our largest international delegations to the event. CWEIC Chairman Lord Marland is joined by over 70 leading Commonwealth business and government leaders from 15 Commonwealth countries covering many of the critical sectors for India’s continued growth— banking and financial services, logistics, oil and gas, and blockchain and fintech. We are delighted the founder of Nigeria’s FAMFA Oil, Folorunso Alakija, is at Vibrant Gujrat with us. FAMFA Oil is one of the largest offshore oil fields in Nigeria, and India is Nigeria’s largest crude oil importer. Other businesses include Lulu Group, the Middle Eastern hypermarket chain founded by Kerala born Yusuff Ali; and Meinhardt Group, one of the world’s largest engineering consultancies, employing 4,500 staff in 47 offices across 20 countries . The connections and business opportunities we will be supporting and showcasing at Vibrant Gujarat are an example of the Commonwealth at work. Gujarat has been at the forefront of India’s trade and engagement with the world for many hundreds of years. The UK—and Birmingham in particular—is proud to be a home to Gujarat’s largest diaspora outside of India. We look forward to India’s continued success at the 2022 Commonwealth Games in Birmingham and to the business, people and sporting connections we can grow together across the Commonwealth. Increasing Commonwealth exports lead to growth, jobs, and better lives for the 2.4 billion people who live in this great group of nations.